I decorated my cake on Sunday! And it turned out amazing! It was really simple to do, too. It took me well under an hour, clean up included. I've been wanting to decorate a cake for a while just for fun. There aren't any special occasions coming up for me or anything! (Although Trent's birthday is a week or two away...hmmm lol) So the other day, when I was getting groceries, there were some angel food cakes on special, so I decided to pick one up. I picked up some frosting and sprinkles to decorate the cake with, and I had some cookie frosting already on hand that needed to be used up, too. The frosting I used was called Frosting Creations by Duncan Hines. 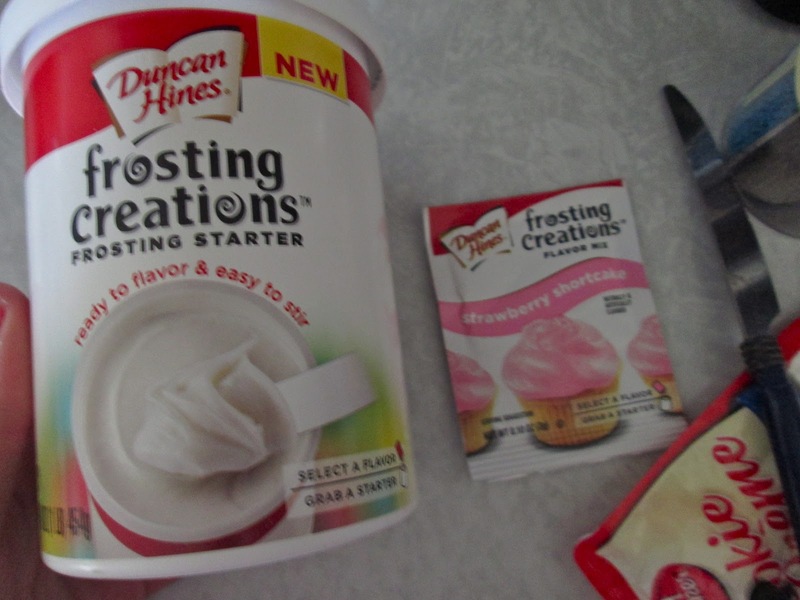 You just get a can of the Frosting Starter, and then they have little packets you add to it depending on what color or flavor you want the frosting to be! 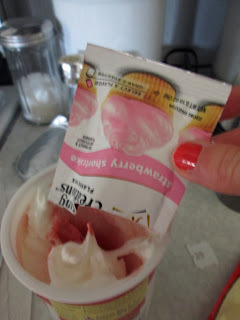 I got a packet of Strawberry Shortcake flavoring. 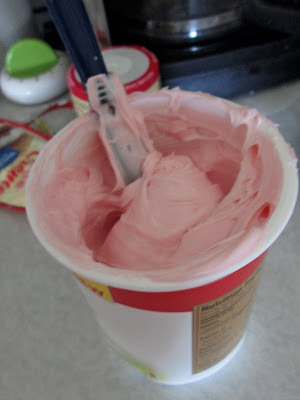 You just create an opening in the frosting, and dump the flavor packet in. Since I don't have a fancy cake stand, I just used one of the nice plates in my hutch that I got from my grandma! And added chocolate sprinkles everywhere, and some dabs of the cookie frosting on top. Then finished it off with the strawberries around the edges. 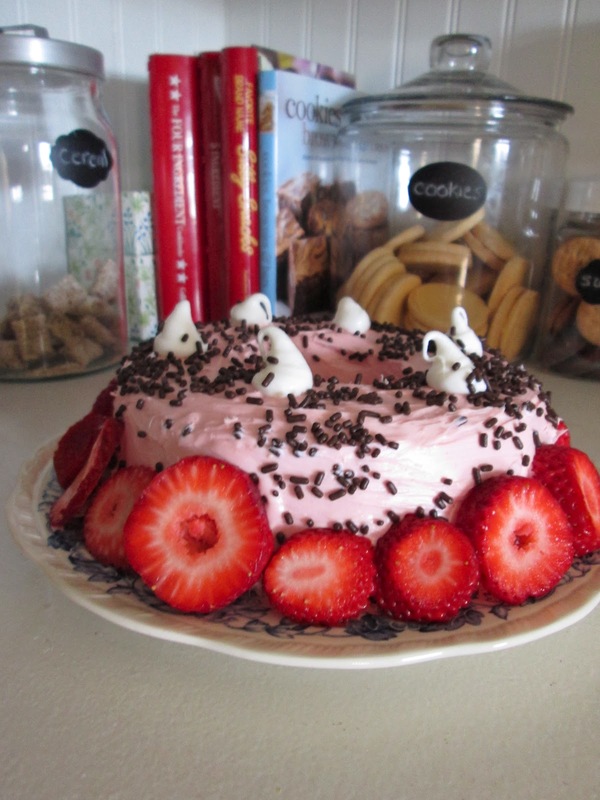 And that was my simple Sunday cake decorating adventure! I was left with a yummy Angel Food cake with strawberry shortcake frosting and chocolate sprinkles! Bookcase Makeover Part 2: They're DONE! Book Review: "Domino: The Book of Decorating"